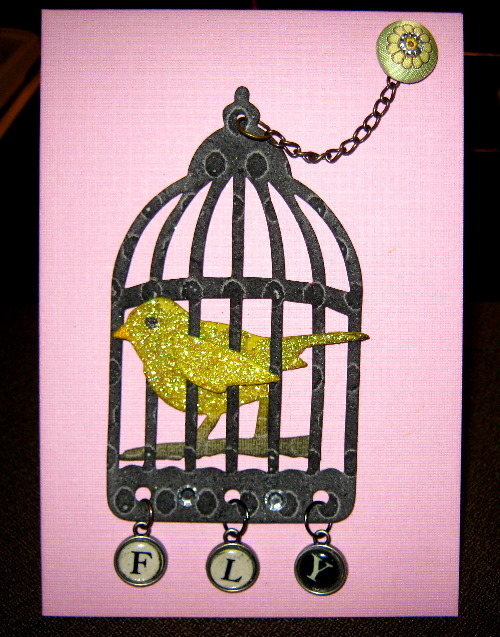 Posted on April 22, 2010 by Albert G.
For my second exploration with Tim Holtz’s new Alterations line, I decided to use the Sizzix Bigz die entitled “Caged Bird”. I also wanted to make a home décor piece instead of my usual card. I have to confess that I’m actually not through with this project, but I was so excited with the results thus far that I couldn’t wait to share it with you. I will be framing this in a thick dark wood frame as it is meant to be a small wall hanging. 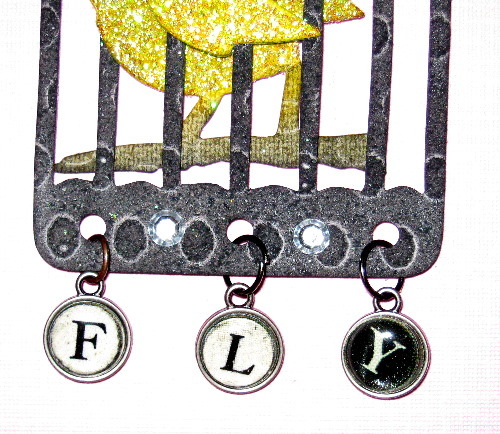 The “Caged Bird” steel rule die will cut three pieces when run through your Sizzix Big Shot or ProvoCraft Cuttlebug. You will get the birdcage frame, the bird’s body on a branch, and a bird wing. Instead of working with cardstock (and since this was intended to be a home décor piece and needed to be a bit sturdier), I chose to use a piece of thick chipboard as my base and Tim Holtz Grungeboard to cut my pieces from. 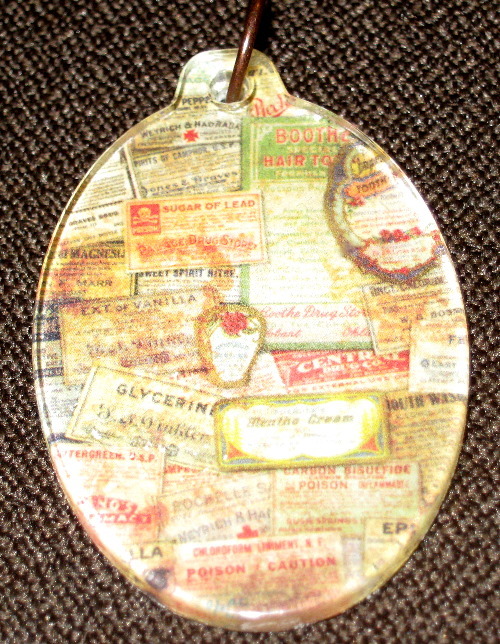 The chipboard is a very sturdy piece from a Die Cuts With A View (DCWV) assorted chip board stack. The 4″ x 6″ chipboard is covered on both sides with a textured cardstock in a dusty rose color. The Grungeboard was a 4″ x 6″ sheet as well, though it had a “dots” texture to it. I would have preferred a plain piece when I started, but in the end, the texture added some nice highlights to the elements. 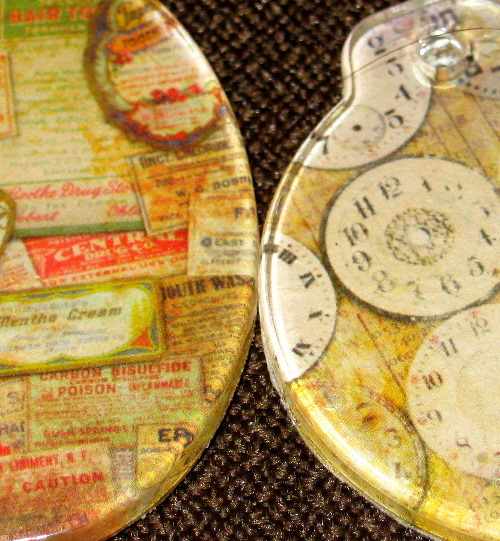 With my Grungeboard pieces cut out via my trusty Cuttlebug, I used some Tim Holtz Distress Inks and my applicator to color the pieces. The cage was colored with Black Soot distress ink. 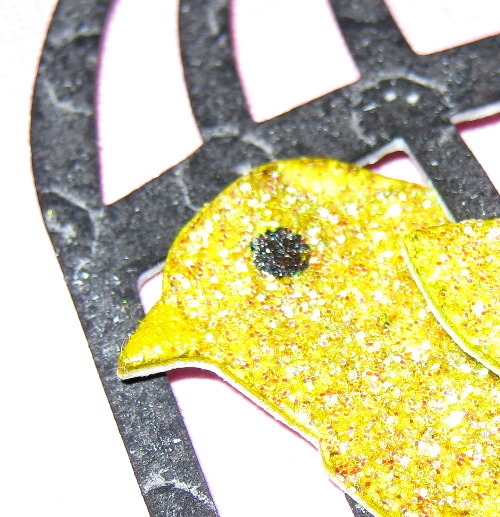 The bird body and wing were colored with Mustard Seed; The legs and branch were colored with Walnut Stain. I was pleased with the look of the cage. The Black Soot gave it the look of an ornamental iron piece that had seen some use and wear. The bird’s body, however, just didn’t pop enough for me with just the inking. 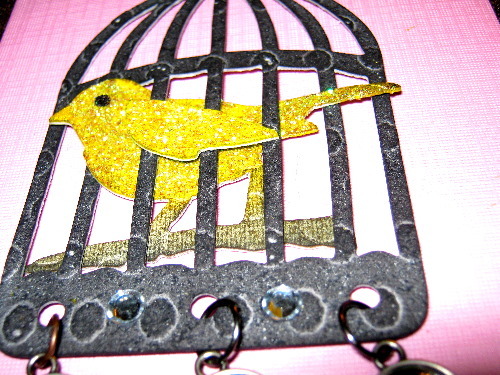 I decided my caged bird needed to be a focal point. 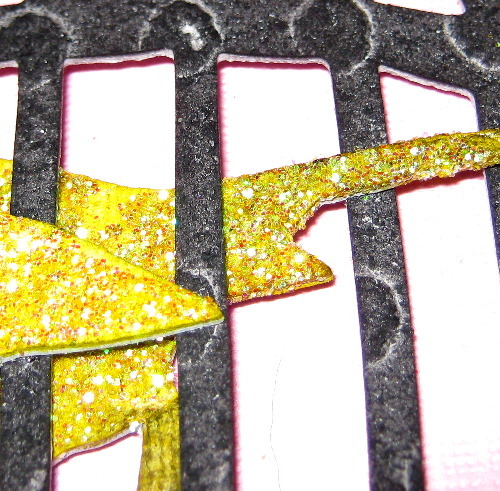 I used some adhesive and canary yellow glitter to coat the body and wing. After they were completely dry, I used some Smooch ink to accent his eye and his beak. One of the main reasons I chose to use Grungeboard was for the pliability and dimension of the material. 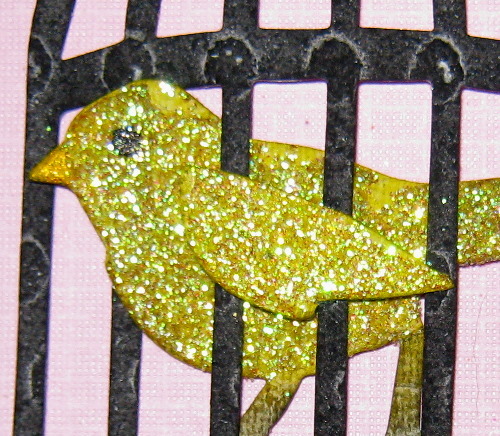 All along, my theme was to have the bird “breaking out” of his cage to leap to his magical flight. That’s why I sort of threaded his body through some of the bars of the cage and made sure his wing was exposed from captivity. This type of manipulation would have been difficult without a material that had some give to it and did not permanently bend or crease. 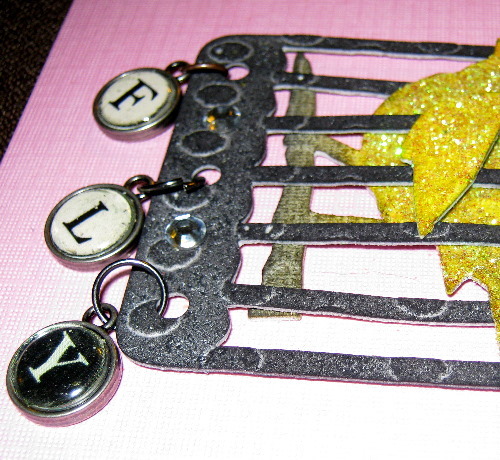 The wing and the cage are attached to the backdrop chipboard using Stampin’ Up! 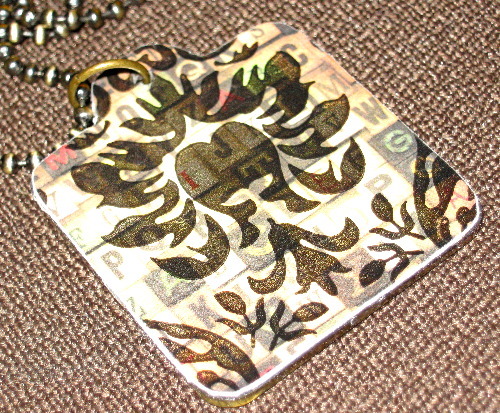 Stampin’ Dimensionals–which again emphasizes the dimensionality of the project. 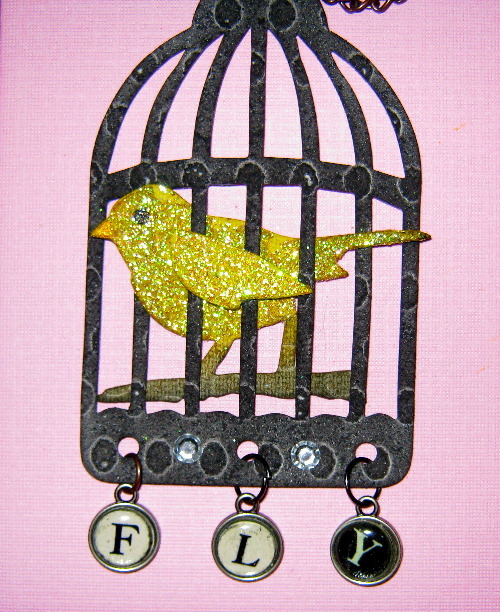 The die for “Caged Bird” punches out five holes on the bottom of the cage as a decorative detail. In my mind, I had already pictured hanging some crystal chandelier drops from the holes. 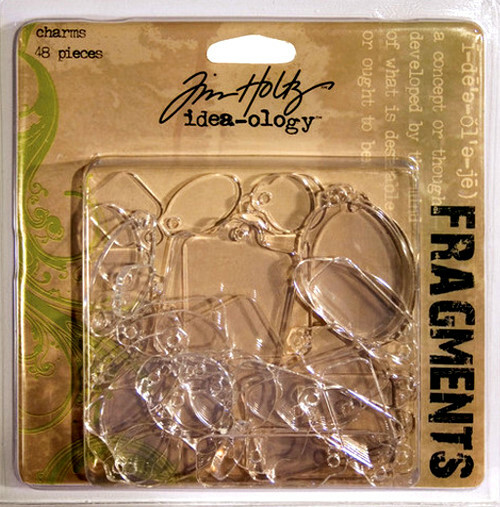 But as I worked on the project and developed the theme of the bird breaking out of his cage, I though some Tim Holtz typewriter key charms might be a better bet. 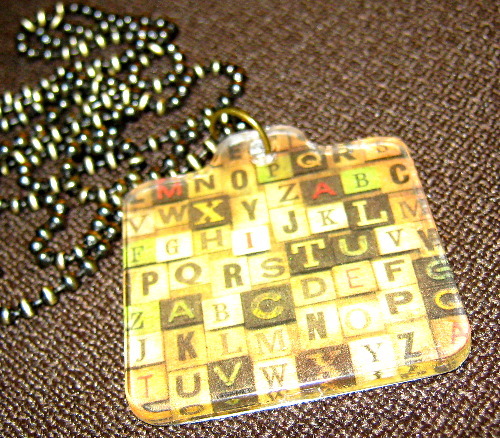 With the sentiment of “FLY” in mind, I chose three charm backings and used the circular alphabet stickers for my word. Originally, I wanted all of the charms to be the creme color. 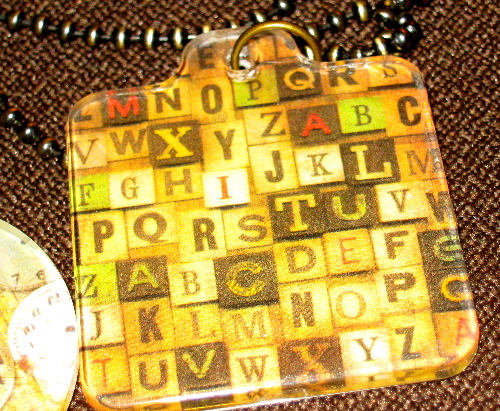 However, I couldn’t find a “Y” in that coloration and had to use a black sticker. At first, I was disappointed with the look. But upon further study, I really like the off-kilter lettering. Not only does it tie into the cage color, but it sort of identifies that “breaking out” theme by achieving your goal no matter what it takes (like the wrong color letter). 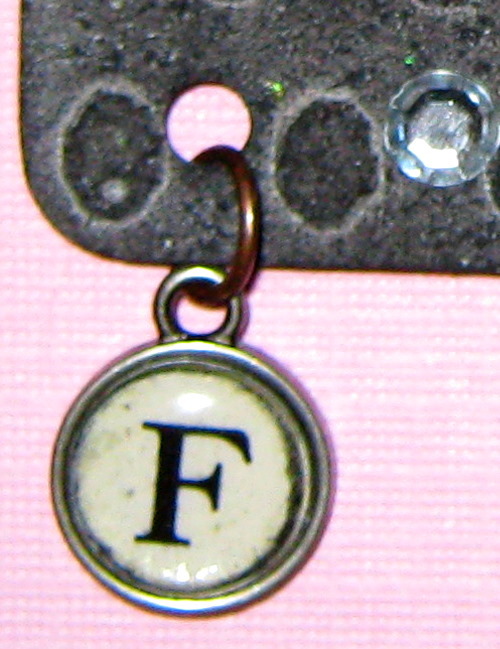 Once you place the letters in the charm frames, you use an adhesive acrylic bubble to cover the charm. 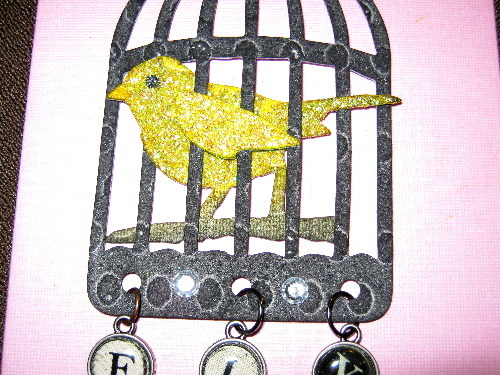 I used some Tim Holtz jump rings to attach the charms to the cage. 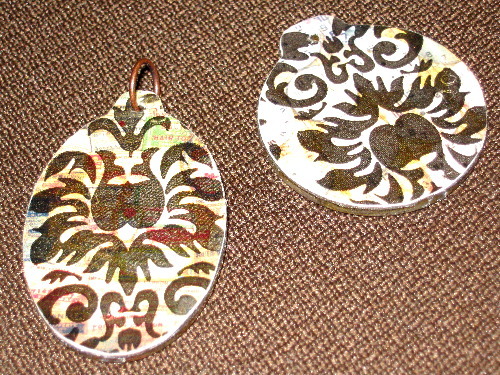 For the two holes that did not have dangles, I covered them with rhinestones. The final touch on the project was the hanging chain atop the cage. 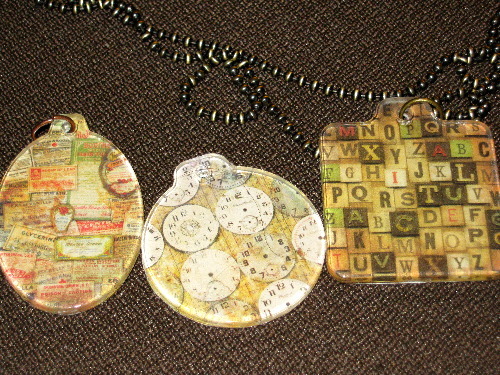 Again, the chain is from Tim Holtz. I attached it to the cage with another jump ring. 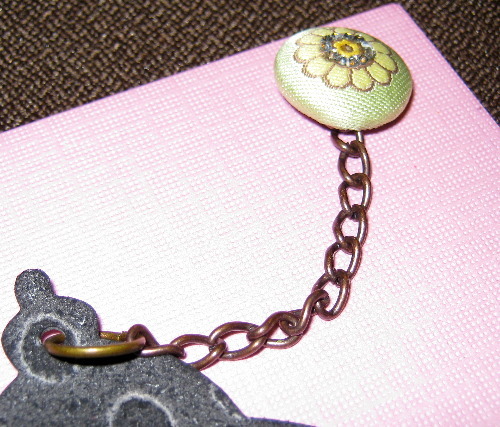 To anchor the chain, I chose a fabric and crystal covered brad from K & Co. to complete the look. I pierced a hole through the chipboard and inserted the brad. I think once I mount this piece in a frame, it’s really going to set off the look. 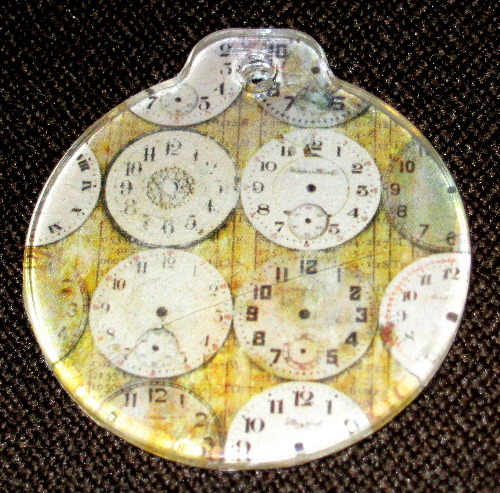 I will try to remember to photograph the finished piece and share it with you later.